I used to go on a bit of a rant about black shoes in my early Snob times, but having moved to London, matured a bit (just only) and been subjected to a lot of wet days, my fondness for black shoes has began to flourish. I also think that part of it was all my shining of black shoes. 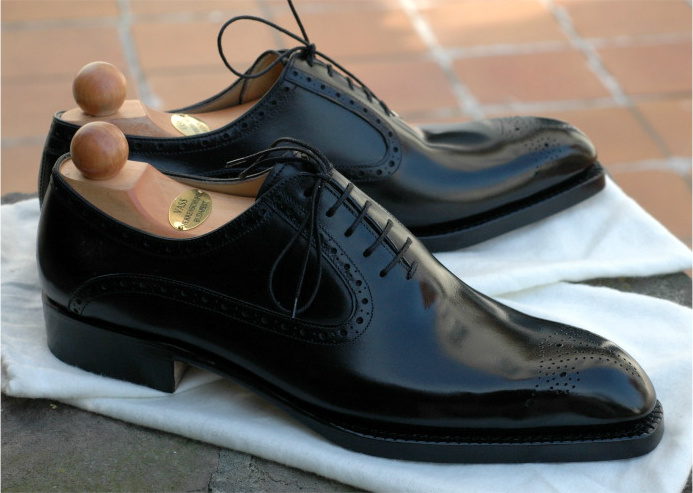 Something about a black shoe being shined just on the caps is simply amazing….that being said, however, I still would rather see a black shoe done differently with respects to your average cap toe or wing tip. While I appreciate them still, I prefer a black shoe to have something special about it, something a bit unique, kind of like this interesting curve from the facing into the quarter line. Even better, Vass decided to add a bit of brogueing to it, to make it stand out even more. For me, this is elegant, unique and blows out of the water, most other black shoes. It shows that while black is such a common color in footwear, it does not have to be common in it’s design to do the trick of “business professional” shoe. As always, Vass never fails to impress….. I believe the below link (it’s from one of your advertisers!) just about sums your post up BEAUTIFULLY. G&G Deco (as mentioned by the commenter Benjy) are hideously overpriced for what they are. And they’re a bit too “trendy” and sharp to be useful for conservative business settings. To the original blogger: the kind of brogueing that Vass does on the shoe in this picture is quite nice, but it’s surely not a business shoe. Apart from a plain cap toe , nothing else is. You could get by with either a wholecut (no lines or whatever) or a simple brogueing in the cap toe lining, but nothing else. So your advice here for a business shoe is misguided unless one is the owner of a business (in which case anything goes really) or in a more flexible business such as advertising. In fact, despite the resurgence of the focus on menswear which does not put the reproduction organs of men at jeopardy, I’m still surprised if I see something other than square loafers with a suit these days. But I digress. With regards to price, the MTO Decos without VAT cost around the same as off the rack John Lobbs or Edward Greens here in Asia, representing an excellent value as my EEE wide feet and rather bizarre high arches may be accommodated in the former. Not to mention my choice of material, colour, and sole, to a certain extent. This value is further compounded should I choose other models from G&G, although lasted shoe trees will not be included. Take care and blessings, my friend. NearlyNormal – The thing that I have a problem with in regards to your comment is that you seem to state things as if they are facts, when in actuality they are simply your opinion, one that I find to be a bit outdated and rigid. This is what I feel I am going to be honest, without meaning to disrespect. I find that this way of thinking (very old world, we are in 2013) is actually the more misguided advice as one individual (or eve a million) cannot dictate what a business shoe is or is not. A shoe can look more professional with respects to another, but that does not make the other invalid for use of business. This is the mentality that we as the world need to get out of if we want to progress. One should not wear pink shoes to a business meeting, but neither should he be confined to a black cap toe.